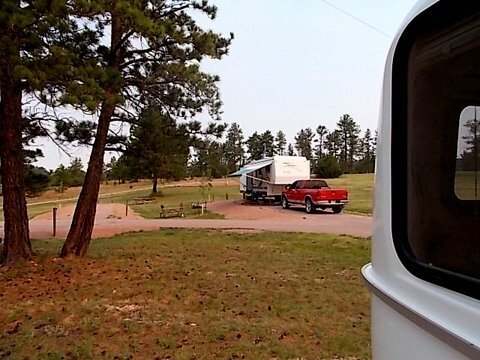 A South Dakota driver’s license, solar energy, RV accidents, and smoke! We’re off to the Department of Motor Vehicles in Hot Springs, South Dakota. I’ve a collection of documents with me, but I’m not optimistic that I’ll obtain a driver’s license in one trip. I walk in and I hear, “rvsue! That’s you, right?” It’s Ron and his wife Elana, readers of this blog and the ones who told me I didn’t have to get my license in the county of my so-called residency. That saved me a lot of gas and time. Imagine bumping into readers of my blog down at the DMV! Well, it did take two trips, but I got my South Dakota license! Yesterday evening the remote meter read zero amps. This morning at 9 a.m. the remote meter indicates 29.76 input from the sun with 14.07 volts at the batteries, but still zero amps. I do a diagnostic with the meter and get “error code 4.” The meter manual cryptically states a code 4 as HVD. Ooooh. An HVD! Of course! Everyone knows what an HVD is!. I look into my crystal ball and determine that HVD stands for High Voltage Disconnect. The manual further states that it would reset twice at ten-second intervals after a decrease in voltage. This didn’t make any sense to me because the meter is still registering zero amps after a nighttime of darkness. Why didn’t it reset? It’s frustrating not to have any option to fix the problem, just wait for a reset that should’ve already happened. So I put the situation out of my mind and motor on down to the DMV. On the way out of Hot Springs, I pick up a hot, rotisserie chicken and a container of rainbow sherbet. Back at the campsite’s picnic table, I fix two paper plates with the chicken skin and the back meat for Bridget and Spike. We feast together, leaving only the breast meat for tomorrow’s lunch. I keep extending our stay here because it’s quiet, pretty, and inexpensive. I open up the PTV to check the remote meter again. Lo and behold, the meter reads 3. 67 amps! Yay, now I can get online and catch up on my blog and the comments and . . . Uh-oh . . . My laptop is dead! I can turn on the power button, but the screen stays black. Much button pushing and turning on and off doesn’t help. Enough is enough! I shut it off and open a book. Later the crew and I walk over to join Larry and Virginia who are sitting outside their fifth wheel. Larry and Virginia are good people. They celebrated their 50th wedding anniversary this month. Soon Dermot, a retired professor of neurophysics, joins us. He’s an interesting and obviously very learned man, originally from Ireland. He arrived yesterday and set up his tent in the campsite next to us. Dermot has great empathy for the plight of the Lakotas who live on a reservation about an hour from here. It’s called Pine Ridge. For the past ten years or so he has worked with the Lakota people whom he greatly admires for their spirituality. I live in a camper and get to talk with a neurophysicist specializing in cognitive development. I love this life! A couple arrives in a pickup and they join the group. They’re fellow locals and friends of Larry and Virginia. We stand facing west to watch smoke rise from beyond the treed horizon. Virginia reports that an RV caught on fire near the top of a hill about 6 miles east of Edgemont. The last she heard the fire has burned 100 acres. The setting sun glows neon orange. Larry says that’s because of the ash from the fire. I’ve never heard of that effect. We all agree it’s a spectacular sunset. Shortly after dark, I excuse us. The crew and I walk back to the BLT. Spike and Bridget settle in for the night while I lie on the bed and read. By the time I’m ready for sleep, I don’t hear any more voices over at Larry and Virginia’s. Well, it’s been a good day for us. Mission accomplished on the South Dakota driver’s license. I don’t need to get a new battery or find a solar repair shop. Boy, did the crew enjoy that rotisserie chicken! In the morning I’ll try the laptop again. Maybe it will fix itself, too! 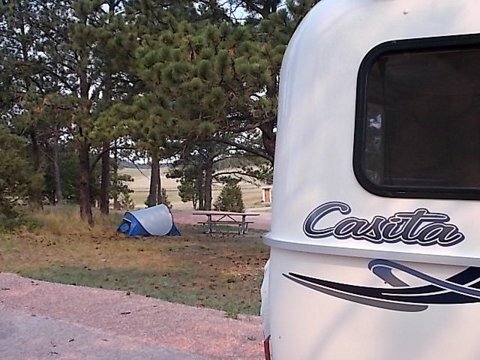 This entry was posted in Simple living and tagged Cottonwood campground, Hot Springs, Lakota, Pine Ridge, remote meter, RVing, Sheridan Lake, solar power, South Dakota. Bookmark the permalink. 58 Responses to A South Dakota driver’s license, solar energy, RV accidents, and smoke! I am glad everything is working again. I was starting to get worried about you. Repairs are my biggest fear on the road. I need to get some warranty work done, but I don’t want to leave my baby in some stranger’s hands……lol. Be safe and I know you will see elk soon!!!!!!!! It’s good to be online again! I feel lost when I can’t read my blog comments or look things up on the internet. Re: repairs . . . I feel it’s important to familiarize myself with the repair or maintenance I’m planning to have done. Then when I’m at the repair shop, I ask lots of questions about exactly what they are going to do. I think I’m more likely to be treated well if I connect with the people and let them know I’m interested in the work they are doing on my vehicle. I agree with every thing you said…..I was married to a guy who could fix almost anything and I learned to do a lot of repairs and maintence. But fixing a generator is not on my list…..
Good luck with the generator! Love the blog as always. I just gotta know though what are you reading? Well, it’s light reading. I picked up two books at a thrift shop recently. Michael Chrichton’s State of Fear (I think I’m the only one in this country who hadn’t read it yet!) and an anthology of short stories. I read “State of Fear” a few years back. Although I reject its thesis of climate change denial, it’s a good read. The novel casts doubt on climate change science, as did Crichton in real life, despite an overwhelming consensus in the scientific community. The only real debate among scientists is about the rate climate change is increasing and the most effective means of arresting it. I second you lonewolfgal. Just did a post on my blog on my fears that all this weather chaos this year, last year, year before………fires, tornados, heat over 100 degrees all over the place, is a result of this very thing. It’s Climate Chaos and we ignore it and doubt it at our great peril. All these “natural disasters” are on the increase that seems very clear. My heart goes out to those who have lost their homes and some their lives to fires, floods, tornados and hurricanes. Why isn’t this a top political issue? Is the economy what really matters first? It’s an uphill battle when corporations that pollute on a vast scale funnel billions into massive disinformation campaigns to cast doubt on climate science findings. The tobacco industry resorted to the same strategy to counter research that showed smoking causes lung cancer. It took years, but sanity prevailed over greed eventually, but whether it will in time to reverse or even slow climate change is open to question. By the end of the century we may be boondocking on Mars. You only thought you were the last one in the country who had not read it. Now I am the last one! I read quite a bit but don’t think I have ever read a Chrichton novel, not really sure why that is so. I just want to thank for writing. I am about to just follow behind you! 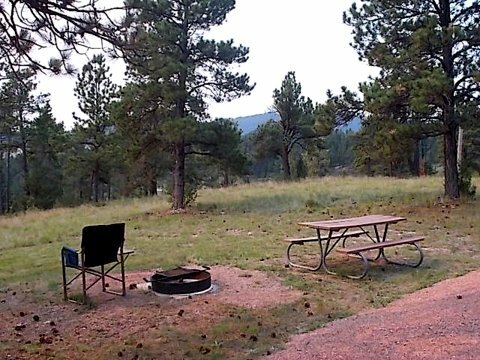 You find some very good camping deals! I travel with three hounds. Don’t get much peace, everyone wants to talk about what my dogs are. I am getting close to my retirement. My van is the ” groovy mobile” or the ” rolling dog house”. Good luck with fire season. Stay safe. See ya out there someplace. Congratulations, Jan, on your retirement soon! You must make some great memories as you travel with 3 hounds. You probably know how important it is to keep those hounds from running off, following a scent. I love hounds. When I did foster care for rescued dogs, I always enjoyed being a “foster parent” to a hound. Glad to know that you are now a legal resident of S.D.! Even happier to know that your solar is working again. Now that you have the legal BS taken care of, you can relax and start you short hops and longer stays again! Since you got your drivers license in Hot Springs, does that mean you won’t be going to Rapid City? Is “Mr Blue Eyes” camp host still around?? I posted a good recipe for peanut butter doggie treats on my blog, Spike and Bridget will love them. Time to get a toaster oven you can put outside! LOL! Yes, Mr. Big Blue Eyes is around here frequently. Yesterday he was doing yard work. Never have I found weed wacking so fascinating! No toaster oven for me! I’d feel the need to justify its purchase by actually cooking something! But see Sue, toaster ovens are so small you can’t cook much. Well, granted I’ve seen some pretty big ones; but you don’t have to get one. I’ve even made some of my oat bran muffins in mine – hey: rainbow sherbet? Is that your once a week spoil? I’ve been waiting to hear from you, Emily, re: the rainbow sherbet! Yes, I’m allowing myself to have sherbet. I love sherbet. Especially on a hot day. . . I like it better than ice cream. At least it’s low fat . . .
Yea, right. It’s not made with cream or sugar. Gottcha. My favorite cooler is a pumpkin shake. My FAMOUS Sister!! !…Known throughout the west. Again, love your post! Hi, Pauline! It is really weird to be recognized in the town of Hot Springs, South Dakota. Wasn’t expecting that! Congratulations on getting your SD drivers license. Just catching up again … you have been a busy traveler lately. Hi, Bob! Glad you’re still with us. Now that I’ve got my license, I can relax and slow down. I am having so much fun this summer! And I haven’t seen Yellowstone or the Tetons yet . . .
“I keep extending my stay because………” yeah, right, ya’ ain’t foolin’ us, there Susie Q, we all know why you keep extending !!!! And why NO pictures of that reason, hmmmm? Enquiring minds want to know……. hehheheeee And you are now a recognized celebrity ! WOW, what changes you have made in your life Sue, in such a short time; traveler,celebrity, photographer, solar tehnician, writer, cougar……. That last label got a laugh out of me! I have just had a brilliant idea! (?) Sue could earn some extra cash by putting together and publishing a calendar featuring Fine Looking Camp Host Men ! Oh, OK, I’ll shut up now! But think of the great excuse it would give you to take a photograph of this guy!!! The high voltage trip may happen when you connect or disconnect the PTV from the BLT or just plugging in a charger. Good that it auto resets but the delay is strange. If it happens often contact Morningstar. Keep the connectors clean and plug them in fully. Congrats on the SD license. Love your Blog. The only thing unusual (power-wise) the day the amps read zero was this: I drove the PTV for a very long time (driving the wildlife loop) without being hooked up to the BLT. I love that you love my blog! Glad the license deal went ok and that is taken care of!! Sounds like a good state maybe. What is your thinking on a 5th wheel…are they more prone to have accidents? One of my best friends thinks they are terribly dangerous…some friends of theirs were driving one on a good weather day and as they rounded a mountain curve, a gust of wind appeared out of the blue, and they ended up over the cliff….alive, but with nothing else…all ruined!! I am wondering how they compare to a trailer or motorhome, in your opinion. I keep telling hubby that I think 5th wheels are simply too tall and look like it could be a problem to drive around. To me safety is more to be considered than having more space to live in, etc!! We are aways off yet in having to decide, but still collecting information and opinions. We have gone to some RV shows and I suppose will yet go to some before we would choose. We may not get a rig for a year or 2 yet….depends on a lot of things right now…but it is good to learn before making that step I think!!! We had a small travel trailer years ago, but had a big old Dodge Van to pull it too, which was plenty of power. Thanks, Chuck, for answering Elizabeth’s question. I’m not qualified to comment on fifth wheels. On the laptop, try unhooking the power and taking out it’s battery for a few minutes, then put the battery back in and connect the power – that forces a reset – typically if one won’t power up that will work. Hope that helps. Thank you, Tammy! You reminded me of that technique…. I think Bill “fixed” my laptop once by removing the battery. Geesh. My memory is no help at all! I bet you are happy to have your licence and have that worry behind you. I liked how the pictures were intermingled with your writing. It tells the story better and feels like we are there with you. I like to insert the photos in the story, too. I use the slideshow when I have loads of photos I want to show and also have for myself to look back on with the post. Lately I’ve been moving around a lot so I have a lot of photos. You’re right. Photos next to the text make it like a storybook. The inserted images show up on your kindle version too! The slide show does not! Can’t help you with the HVD thing. Glad you got your DL taken care of…………………………..onward! The manual with my remote meter is full of acronyms that makes it very difficult to understand. I’m wracking my brain trying to figure out what HVD means . . . How Very Depressing . . . Hot Volts Die . . oh! . . . High Voltage Disconnect. Why not spell it out? Are they trying to save ink for heaven’s sake? No,, I think technical writers think it’s a funny joke. Did “eye candy” have to take off his shirt when he was working around the campground? We can only hope. I’ll let you imagine . . .
I’m getting a kick out of everyone’s comments. Glad you were able to get your driver’s license without too much of a hassle. Do you also have to get the vehicles registered there too, since the license is there? Yes, both vehicles were registered in SD through Americas Mailbox last August. I can renew the registrations by mail. The vehicles are registered in SD because that’s my state of legal residence. RVSUE, I have just finished reading your entire blog, from start to today. After about 6 days of absorbing your adventures, I feel as if we are personal friends, and find myself wondering what you are doing at certain times of my day. You have such a wonderful way with words. I’m wishing I could do what you are so easily doing. I also have a 17′ Liberty Deluxe and two rescue dogs, both black dachshunds. I love it that you understand Bridget and Spike so well. I am single, 71, and 2 months into retirement. You give me hope that I will reach a decision soon. I am very impressed with your independence and ability to handle any situation that pops up. Your pictures are as informative as your words! Thanks for sharing with us all. I am so proud that you read my entire blog from the beginning. Welcome! I’m happy you are with us. You are a smart lady, choosing a Liberty Deluxe and rescuing two dogs. We have that in common. I’m glad that my blog is helpful as you decide how you are going to get the most out of your retirement. Congratulations on completing your work years, and thanks for writing. Congrats on being a legal South Dakotan. Thanks. My new driver’s license photo is out of a horror flick. I agree with John. Your tow vehicle, whether towing a trailer or a fifth wheel, is most important. The other safety tip I feel compelled to mention is “drive slowly.” Your margin of error increases as your speed decreases. I let people by whenever I can safely do so. Sometimes I see people with huge trailers or fifth wheels racing down a two-lane road and I shudder to think what would happen if . . . . Being a safety-conscious person (which I can tell you are) will help you in many ways on the road. Hello Sue, A facebook friend of mine gave me the link to your blog last night. I have read about 90% from beginning to end!!! I missed some because I clicked a link and forgot to see where I was in the progression of your blog. I really admire your courage and adventurism spirit!. Anyway, I recently retired, purchased a 2005 Aliner Expedition (hard side popup) and joined a regional Women’s camping group. I have camped before with the hubby (now ex) and son (now grown) doing the “few times a year” camping/fishing trips. I have clicked the “follow” link and looking forward to your next post. Hello, Kate! Welcome to my blog! You read 90% of my blog within a 24-hour period? I hope there’s an antidote for that. Bless your heart. I assume you’ll be camping with electric hook-ups. I don’t know what I could not do without other than the obvious things . . .camp chair, percolator, etc. If you’ll be camping for a month, I’d recommend bringing a month’s supply of underwear. That way you can always manage, even if you don’t get to a laundromat. If you forget to pack something, you can always make a run to a store. It sounds like you and your camping friends are going to have a wonderful time.Enjoy! Thanks for writing and for becoming a follower! 🙂 I read Fast! one of my FB friends gave me the link about midnight.. i read until 4 am. then when i got up the next ummm day 🙂 until i finished. @hobopals, I will check on the undies from REI and Columbia. Would be good to have in the camper. btw? may I post the women’s camping group link ?